earth was a cold planet of rock-crust and water; then life seeded the oceans…and after eons, multiplied on the land. Man, the reasoning creature of this fruitful life-process, constantly asks why?…why?…and how? This is the middle of a set of three biochemistry books Asimov wrote in the 1950’s and 1960’s which form a progressive examination of the field. The first, The Chemicals of Life, was written just in time to miss including the Watson-Crick double helix model of DNA. 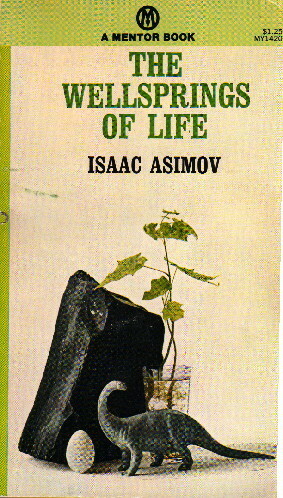 Asimov took advantage of the writing of The Wellsprings of Life to cover the double helix, but just wrote it just in time to miss including the cracking of the genetic code, which he was able to cover in The Genetic Code. The second section is a general overview of the organization of life on the planet into phyla, subphyla, and so on, and a brief overview of cytology. The third then delves into the molecule and covers basic biochemistry, focusing on proteins, enzymes, and the DNA that makes them. The book ends with a chapter on the modern spontaneous generation and how science currently feels life on the Earth may have originated. This is, in fact, an excellent volume which manages to cover a broad amount of material in a fairly short space. Each section is thorough, straightforward, and simple to understand, and the sections are interwoven well to create a coherent, logical whole. It is also a book which provides a good broad understanding of Asimov’s own philosophy regarding science, rationalism, religion, and ethics, and so is a good introduction to some of the author’s own approaches to life, as well.